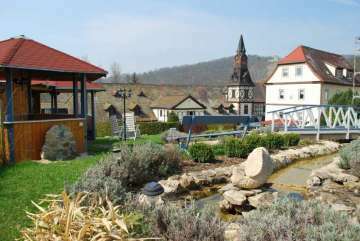 The holiday village is situated on the outskirts of the spa and wine town of Bad Sulza, in Thuringia. It lies in the midst of the triangle of the university town of Jena, the classical town of Weimar and the cathedral city of Naumburg. This holiday house with 9 apartments offers fantastic opportunities for relaxation. It is just 10 minutes on foot from Toskana Spa and 3 minutes from the tourist office. Near the house you will also find a number of facilities including a shopping center, laundry/ironing facility, grill parties at Thüringer Bratwurst; a mini-library for people of all ages, and a toy and bike rental service. For a small fee you can use the conference / banquet room which can accommodate up to 80 guests. The separate, newly-appointed kitchen (with dishwasher, electric stove, various appliances, crockery, cutlery and glassware) and summer pavilions with barbecue places invite you to enjoy a cookout. For the younger guests there is a 13,000m2 enclosed nature area which makes an ideal place to play. The long summer evenings provide the perfect setting for enjoying a variety of house wines. There are 2 hospitals in close proximity to the house. Bad Sulza is a small town on the Ilm [river] in Thuringia. It is known as a spa and wine town in the Weimarer Land district of east Thuringia. It is especially well-known for its health and wellness facilities. Bad Sulza lies amidst the green heart of Thuringia, called the “Tuscany of the East” because of its dense forest (Thuringian Forest). Weimarer Land enjoys a rich tradition of nearly 1000 years in wine production. Near Bad Sulza you will find the beginning of the Saale-Unstrut "wine route" which takes you through the northernmost wine region of Europe (Kösen, Freyburg and Nebra). Be sure to enjoy a good glass of wine along the way! The rich variety of culture, nature and landscapes draw numerous tourists to this region each year. For relaxation and well-being, there is Toskana Spa. In the Liquid Sound Temple you can swim accompanied by light and music. Sites such as Dornburger Schlösser (3 castles) with its rose gardens, Naumburger Cathedral, the towers of Rudelsburg and Saaleck, and the settlement of Eckartsburg are just a short journey away by car or train. This is also an ideal place for hiking, cycling and boat excursions. With its vast forests, rolling hills, winding valleys, vineyards and healing water Thuringia can be enjoyed in every season. Of course there are a number of attractions and viewpoints that should definitely not be missed including Apolda (15 km); the Wasserburg Clock Museum in Kapellendorf (20km); the cities of Jena (21km), Weimar (30km) and Naumburg (23km); Auerstedt castle with its museum; the Auerworld Palace (“Willow Palace”) (4 km); Kromsdorf Castle (25km) and Bad Kösen (10km) with its salt mine. The non-smoking "Koralle" apartment is located on the first floor of theMaritime holiday house. This tastefully decorated apartment has an area of about 15m2 and can accommodate 2 persons. The living room contains a dining area, double bed (140x200), wardrobe, TV and fully-equipped kitchenette (with dishes, coffeemaker, toaster, kettle, egg cooker, microwave and fridge/freezer). The bathroom has a shower bath and toilet. Bed linen is included in the price and will be changed once. Breakfast can be booked on the spot. Pets are not allowed. WLAN is available upon request. This smoke-free home is a 4-star accommodation.